My grandmother, Magda Brown, excels at building and cultivating relationships. This is inherent in her nature, but she is also driven by a personal mission. 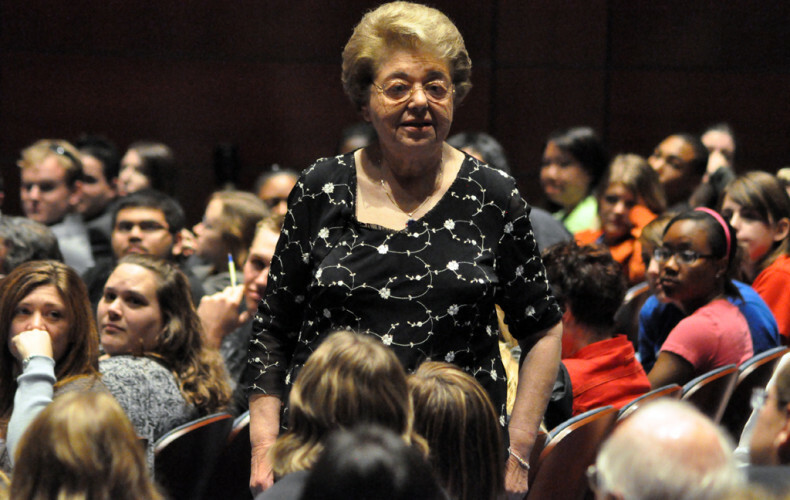 She is determined to share her story of surviving the Holocaust with as many people as possible. Through telling her story, she hopes to make future generations conscious of the signs of genocide so they can prevent future atrocities. I recently sat down with my grandmother to talk more about her approach to relationships – lessons I strive to apply in my own life. 1. Sit by someone you don’t know. “I tell my friends, ‘Don’t save me a seat. I like to sit with people I’ve never met before.’ It took a while for my friends not to be offended,” Grandma Magda joked. Years ago, my grandmother struck up a conversation with Jonathan, a young man sitting next to her at a concert. He was a Methodist pastor and invited my grandmother to speak at his church. Jonathan went on to become a professor at Aurora University, and my grandmother spoke to his class year after year. She became so involved with the university that they gave her an honorary degree. And Jonathan became such a close family friend that he officiated my sister’s wedding. That stranger you sit next to could be end up having a large impact on your life. 2. Be open to new opportunities. You never know what an experience may lead to. For example, one woman heard my grandmother speak at an event at the state capital, then suggested her as a guest to a Catholic radio station. The radio station interviewed my grandmother, then decided to distribute her testimony to all of the Catholic schools in the area. “This is how the message spreads,” she said. 3. Follow up and follow through. When my grandmother meets people through her travel and speaking engagements, they often talk about visiting each other when they’re in town or bringing her in to speak at their school or congregation. The thing that astounds me (and this may be a reflection of my generation’s flakiness) is that everyone follows up and follow through on these discussions. There are no empty gestures. “I try to keep my refrigerator packed with homemade goodies so I can serve my visitors,” she said. My grandmother stays up to date on technology and trends to ensure she can relate to her audience when speaking and get her message across. “I have to know their language to connect with these children,” Grandma Magda said. She happily poses for selfies with middle-schoolers (she briefly called them “sophies,” until my mom corrected her) and has started to do Skype Q&As with classes around the country. 5. Find a great mentor. As a young woman who had recently immigrated to the United States, my grandmother came down with pneumonia. The doctor who treated my grandmother – a fellow Hungarian Jew – saw great potential in her and offered to train her to work in his doctor’s office. My grandmother seized the opportunity. She went on to become a medical assistant and worked with Dr. Schwartz for 40 years. My grandmother said that Dr. Schwartz taught her the importance of treating all patients – and all people – as equals, a lesson that continues to influence her approach to relationships today.